When the early Christian Jews concluded that the appearances of the YHWH Angel prior to Jesus' birth must also have been Jesus somehow, this gave Jesus a pre-existence and it shifted the paradigm. No longer was he a normal human being born of normal human parents. Somehow this great Angel had been embodied either at Jesus' conception or his quickening. In other words, a human fetus was possessed by this Angel, rather than a human man at his baptism. The Christians shifted his possession to the earliest moment possible. The idea that an angel can possess a human being is possible because the ancient people understood "spirits" and "angels" to be equivalents. This is also the case with the word "powers." The angel was a spirit who like a demon could possess a human being. The virgin birth stories are related to this shift. The story of womb-possession is very prominent in Luke's gospel, which parallels John the Baptist's conception with Jesus'. John the Baptist was "filled with the Holy Spirit even from his mother's womb" (Luke 1:15). Jesus' conception is understood similarly, as the Holy Spirit, the Power of the Most High, coming upon Mary so that her child would be the holy Son of God. Keep in mind that angels are sons of God. And prophets are called and consecrated (which means a descent of the Holy Spirit into them!) from before they came into the womb of their mothers (see Jer 1:5; Isa 49:1; cf. Gal 1:15). In Matthew, the relationship of Jesus to the Holy Spirit is framed in terms of agency. Mary is found "having [a fetus] in her womb FROM the Holy Spirit" (1:18). This is another shift in this christological pattern. It moves the concept of a divine fetus to divine parentage rather than spirit possession. This shift may have been popular with Hellenistic audiences familiar with stories of gods siring heroes. I think it is significant that since these two authors think that the embodiment of the Spirit happened to the fetus in the womb, both Matthew and Luke independently shift the Markan baptism account of possession of the Spirit "in" Jesus (eis: Mark 1:10) to "upon" him (epi: Matt 3:16; Luke 3:22). Since he has had the Spirit in him since the womb, the baptism is reconceived as an outward anointing of the Spirit. Next post we will look at Justin Martyr who preserves this paradigm in its entirety. Jesus was not conceived to be exalted to the status of any angel of any rank. He was conceived to be the Angel of the Lord who bore the Name YHWH. This conception did not stand alone. The YHWH Angel was read alongside the GLORY by the early Jews and Christians. There are a number of passages in Jewish scriptures which describe YHWH as a bodily manifested god. His manifestation is called in Hebrew "the KAVOD of YHWH" which literally means "the weightiness of YHWH." It was translated by the ancients into Greek with the word "DOKSA" which means "reputation, honor, glory." When it refers to one's external appearance, it means that it is a splendid or glorious appearance. In English it is translated "GLORY." This figure is described by Ezekiel as humanlike, radiant, and enthroned. It acts as YHWH, and he interacts with it as YHWH. This manifestation of YHWH, the KAVOD, is also called in the literature the "IMAGE" of God and the "FORM" of God. Of course those of my readers who know the Christian literature will realize that this application to Jesus was made very early in the tradition. He has the NAME of YHWH, he is the FORM of YHWH, he is the IMAGE of YHWH, he is the GLORY of YHWH. He has not only been identified with the ANGEL YHWH, but also the KAVOD, identified with the seated figure in Ezekiel's vision and the YHWH of HOSTS seen by ISAIAH. As I said in my last post on the subject, this is the key to understanding the development of early Christology. Once the identification was made between Jesus, the YHWH Angel, and the KAVOD, there was no turning back. The Christian Jews had begun to understand Jesus as equivalent with YHWH. As far as worship, it appears that our earliest sources tell us that they were calling upon Jesus' NAME in intercessory ways, including healings. Now there is ample (and I mean ample) evidence in Jewish literature and magical objects from the period that show that there were Jews who were calling upon angels to intercede for them and to facilitate healings. The magical evidence from amulets and gems shows that the use of the angels' names were considered to be very powerful indeed. Many scholars in the past have tried to explain away this evidence and to impose modern rabbinic and christian orthodoxy on the past in order to state that the Jews were not really venerating angels or practicising angel intercession because we all know they were monotheists. This is anachronistic and apologetic. The evidence both in the literature and the physical objects matches. The late second century rabbis generally disapproved and tried to stamp it out and write down their oral traditions in such a way that their ancestors would appear to be monotheists. But what the rabbis were doing was creating monotheism themselves, perhaps in response to the rise of Christianity from the Jewish sources, and I might add, the rise of Gnostic systems from these same sources which also relied upon the YHWH Angel and KAVOD traditions to develop the Demiurge. In my opinion, the academic discussion is usually backwards. The discussion should not be how monotheistic Jews could or couldn't have worshiped Jesus. The discussion should be along these lines: what must Judaism have looked like at the time of Jesus to allow his Jewish followers to conceive of him as YHWH and begin praying to him and using his NAME for intercession? The impulse to divinize Jesus was an impulse within Judaism, and the later Rabbis knew this and reworked the traditions to try to shut it down and create a post-temple Judaism, which was a revival of the type of Judaism embraced by the group of post-exilic priests who put together the pentateuch and tried to rewrite their old polytheistic ancestral traditions along monotheistic lines. It didn't work in post-exilic Judaism mainly because the YHWH Angel and KAVOD traditions survived, allowing for exegetical interpretations to develop in which GOD remains hidden while he operates through his manifestation, his equivalent enthroned in heaven. This isn't about the election. I've just been enjoying your ORIGINAL GOSPEL OF THOMAS IN TRANSLATION. As someone who got interested in the Jerusalem Church, James, and offshoots of that community while taking a course on the gospels at Davidson College years ago, it's interesting and good to see the Thomas material less thru the Gnostic frame and more as what it is/was. I've always been curious as to at what point early believers started to think of Jesus as God or equate him with God, so the material relating to the NAME Angel was especially interesting because out of all of the material, it was completely new to me. Would you, perhaps, point me to some additional articles and/or early texts where the NAME Angel theology is expressed or implied. If so, I'd be very grateful. The classic comprehensive study is Jarl Fossum, The Name of God and the Angel of the Lord (Tübingen, 1985). This is the book of my own teacher, from whom I learned these ideas. I apply them to everything I do, but I wrote a piece recently in which I tried to incorporate them into my discussion of the origin and development of Christology. This article is April DeConick, "How we talk about Christology matters," in David Capes, April DeConick, Helen Bond and Troy Miller (eds. 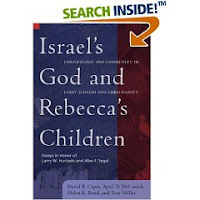 ), Israel's God and Rebecca's Children (Waco, 2007) pp. 1-24. One of Fossum's other students, Charles Gieschen, has written significant pieces on the subject. The most accessible is an overview article published in my favorite early Christian studies journal, which I highly recommend: Charles Gieschen, "The Divine Name in Ante-Nicene Christology," Vigiliae Christianae 57 (2003) pp. 115-158. See also Gieschen's book, Angelomorphic Christology: Antecedents and Early Evidence (Leiden, 1998). Enjoy! I shall endeavour to persuade you that there is, and that there is said to be, another God and Lord subject to the Maker of all things; who is also called an Angel, because he announces to men whatsoever the Maker of all things, above whom there is no other God, wishes to announce to them;....that he who is said to have appeared to Abraham, and to Jacob, and to Moses, and who is called God, is distinct from Him who made all things, I mean numerically, not in will. Heraclides: Of course. How can he be Son if he is also Father? Heraclides: He himself is also God. Hearclides: Yes. The power is one. Origen: But since our brothers take offense at the statement that there are two Gods, we must formulate the doctrine carefully, and show in what sense they are two and in what sense the two are one God. "Apocryphote of the Day", "Christology", "Justin Martyr", "Origen"
Lots of comments yesterday. Thank you to all for raising good issues. 1. I want to post here Rebecca Lesses' comment because she is SO right to bring this up. It is the same in Christianity which is why I said in my post that whether or not you think Christianity became a monotheistic religion depends on how you view the success of the Trinity. Rebecca Lesses: And even after the rise of rabbinic Judaism, we still find Jewish mystical texts that are very questionably monotheistic - see the treatment of Metatron in 3 Enoch, among other Hekhalot literature. (Some of the texts call him Metatron YHWH, after all). I sometimes think that it's only because of medieval rationalist philosophers like Maimonides that Judaism became truly monotheistic (and that's only if you focus on the rationalist tradition). The doctrine of the Sefirot in the medieval kabbalah is questionably monotheistic in the same way that the doctrine of the Trinity in Christianity is questionable. 2. Definitions always get in the way. Monotheism is always going to be a stumbling block for us. I say along with Paula Fredrikson, RETIRE IT! for our period. Let's work out a better language to talk about what was going on. If I can pray to an angel and get help (i.e., be healed) and still be considered a Jew or a Christian, what should this be called? If I think that God can manifest himself on earth in various forms, and I start worshiping one of them (i.e., Jesus) in addition to the father, and still be considered a Jew or a Christian, what should this be called? 3. As for the issue of exclusivity. Well it does and doesn't work. There were ranges of possibilities within early Judaism. Some Jews saw Yahweh worship as exclusive - as in Yahweh is unique and other gods cannot be assimilated to him. Other Jews were fine with assimilating him with other gods. Were the Jews known for worshiping Yahweh? Absolutely. Were the Jews known for resisting his assimilation? Absolutely. But keep in mind that this was only SOME Jews, and these particular Jews had a loud voice that the Romans noticed because it was the voice of RESISTANCE which led to uprisings and conflicts that they had to deal with. 4. We must move to more complex understandings of the historical situation. This is tough for us because we want things to be simple. But they are never simple. Just look at Judaism and Christianity today. Look at the range of ideas and the range of reactions to them within the communities. The ancient world would have been no different, except for the fact that each community had less knowledge at any given moment about what other communities were doing around their world. So insular developments of traditions should be expected to some extent. Early Jewish and Christian polytheism? Well, because you asked. I've often wondered to what extent and in what ways Christian doctrine concerning the divine was influenced by the emerging Rabbinic orthodoxy (ca. AD 200). That is, Rabbinic orthodoxy seems to have introduced a stricter monotheism to the matrix of Judaisms that included Christianities. Did that part of Christendom which is now called 'proto-orthodox' Christianity likewise, and in response, seek to 'tone down' its polytheistic understandings of divinized humanity, a divinized Christ, angelic and demonic beings, and a Most High God? How do the discussions going on in Rabbinic Judaism provide a normative influence on Christianities which previously seemed quite open to a hierarchy of divinities, even in its 'proto-orthodox' quarters, as is evidenced in the Epistle of the Apostles, or the Odes of Solomon, or Mileto, or the Gospels of John and Thomas? I don't have a great deal of time these days since I've become involved in writing another article on the Gospel of Judas (you won't believe what I have been finding!) and trying to get prepared to fly to Amherst this weekend to give a lecture on the Gospel of Judas on Friday night to a CSSR group. Here's my quick take on Wrong's question. It is undeniable in my opinion that Judaism and Christianity before Nicaea were not monotheistic religions (as we define it today). In fact, one can question whether Christianity ever really became monotheistic - all depends on how convinced you are that the doctrine of the Trinity actually resolves the polytheism of a Father and Son being worshiped. Of course there is absolute resistance to this idea, especially among scholars who want early Judaism and Christianity to be monotheistic. So they have come up with all kinds of ways to contort the sources and their readings of them to make it look otherwise, including playing the heresy card. But here are the facts as I see them. The first Christians were Jews. They had no problem worshiping Jesus alongside the father god almost from the start. I think that this worship was pre-Pauline, and centered in Antioch, although I do not rule out Jerusalem (see my paper in the book Israel's God and Rebecca's Children, "How we talk about Christology Matters"). They thought that Jesus was God's great angel who came to earth as a human being and was exalted to the angelic status of the NAME angel at his resurrection. The Jews in the Second Temple period from Philo to Qumran to all the Jewish apocalyptic texts believed that God manifested himself as the NAME angel on earth. This NAME angel, because he was invested with God's NAME, was essentially GOD. The Samaritans had various sectarian movements in the first century that played on this theme. 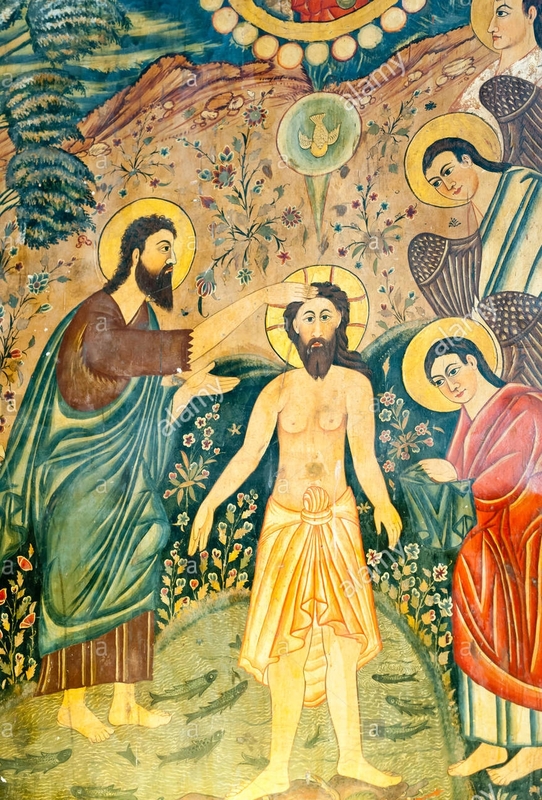 Simon the Samaritan taught that he was the manifestation of this POWER of God, and that he had been sent to earth from the father in order to save the lost soul. The Jewish gnostics in the first century were able to develop the demiurge myth because they relied on these same ideas - that God had a NAMED angel YAHWEH who was distinct from GOD yet was the GOD who created the world. Then there are all the polemics among late first and second century Christians about who is worshiping angels, who is asking angels for intercessory favors. Christians or Jews? Then we add to this all the polemics that developed in the late second and third centuries among the rabbis about the TWO POWERS heresy and how authentic Jews only worship YAHWEH. Then we find poor Arius caught in a ferocious battle over whether or not it is desirable to continue to call Jesus an angel and worship him as second in command. I could go on and on. My point is this. Early Judaism and Christianity were not monotheistic religions, but were at best monalotrous (=worshiped one god but allowed for the existence of other gods). It was because of this that Christianity was able to be born out of Judaism as a Jewish expression of a new form of Yahwehism, and Gnosticism could become the fancy of Jewish intellectuals living in first-century Alexandria. This must mean that the program of some of the post-exilic priests to make Judaism a monotheistic religion DID NOT WORK, as in fact the wisdom literature and Sophia traditions prove in my opinion. This had to wait until the rabbis came along and created what many consider the basis for modern Judaism, and insisted that all forms of worship other than YAHWEH be banned. Whether or not the bishops and church theologians ever really made Christianity monotheistic depends on how well one thinks that the Nicaea decision and later the doctrine of the Trinity really worked. As an aside, this scenario is not new stuff, nor is Boyarin the first to discuss some of these issues in his book Borderlines (2004). In fact, Alan Segal in Two Powers in Heaven (1977), and Jarl Fossum in The Name of God and the Angel of the Lord (1985) and The Image of the Invisible God (1995) were the two scholars who made the case initially, and wrote about it brilliantly. Just got this e-mail from Amazon. I got a laugh out of it since I'm one of the co-editors with David Capes, Helen Bond, and Troy Miller. Anyway, this is a great collection of articles in honor of Larry Hurtado and Alan Segal. And this is a great price. It is over 600 pp. and hardcover. Many new insights on the development of Christology and issues of community in early Christianity. We've noticed that customers who have purchased or rated books by Oskar Skarsaune have also purchased "Israel's God and Rebecca's Children: Christology and Community in Early Judaism and Christianity" by David B. Capes. For this reason, you might like to know that "Israel's God and Rebecca's Children: Christology and Community in Early Judaism and Christianity" will be released on January 15, 2008. You can pre-order yours at a savings of $22.18 by following the link below. "Book Note", "Christology", "Publication and Professional Announcements"
I couldn't mention this book before because it was a surprise reveal at SBL. But I helped edit a book honoring the scholarship and friendship of Alan Segal and Larry Hurtado. We have called it Israel's God and Rebecca's Children: Christology and Community in Early Judaism and Christianity (published by Baylor Press). The book is very integrated, very much like a conference volume with cutting edge papers. I don't have the book here at home, so if I miss an author is is due to my memory failure and nothing else. Contributors include Fredrikson, Adela Collins, Bauckham, Dunn, Epp, Thompson, Bond, Foster, Casey, Miller, Newman, Gieschen, Levison, Klawans, Elior, Fitzgerald, Perkins, Capes, DeConick. And we had Alan and Larry contribute pieces for each other, telling them that the book was for the other person! So this is the book I was working on all summer with David Capes. Since we are both in Houston, we worked in my office on the book, bringing it together just in time to be printed for the final joint AAR/SBL meeting. We had a surprise reception at Lou and Mickey's across the street from the convention center. Alan and Larry were completely surprised and delighted with the book. Carey Newman brought the project to reality, and we are all very thankful to him. The book is gorgeous. "Book Note", "Christology", "Early Jewish and Christian Mysticism"